When I was young, I used to believe that I knew what a revolution would look like. It would begin with a bitterly unpopular government and a political system which allowed no space for dissent to be expressed. Anger with the government would rise and, with it, popular organisation, until the will of the people would be like a great wave of water overwhelming every wall put up by the enemy. An alternative revolutionary government would be formed; it would derive its support from the workers, winning other classes to their side because of the wholly principled way in which it would deal with every social question. It would be opposed by the wealthiest people in society and everyone willing to ally with them. Some kind of civil war would follow between these two powers. And then, when the triumph of the revolutionaries was complete within that first, fortunate nation, next they would face, and hopefully, but without any guarantee of success, defeat the hostility of the most powerful states of the rest of the world. The coalition between Syriza and Anel is not a revolutionary government; and yet the mere fact that its representatives are prepared to state clearly that austerity is not in the interests of the Greek people has brought about already a greater challenge for orthodox politics than anything Europe has seen for years. In the shadow of Syriza it is possible to think as to what a revolutionary crisis would be like here – if we had a force with equal support and as eager to see the end of capitalism as Syriza is to halt our present epoch of austerity. Much of what I used to imagine about a socialist revolution, I find myself questioning. I no longer think that it would begin within a political system which had succeeded in closing down any possibilities for tolerated dissent. The point about neoliberal capitalism is rather that it allows a certain, limited space to every possible idea, every desire, even the phantasm of its own destruction. Therefore, especially in those countries which have seen a permanent shift towards a form of (albeit limited, capitalist) political democracy, I find it increasingly difficult to conclude that popular resistance will be expressed solely in society and not to some extent also in the state, that is, in part through the emergence of anti-system parties which stand for office and are part of a revolutionary alliance. I do still believe that in a revolutionary crisis people’s anger against the system can be renewed, and grow, overcoming every obstacle in its path. Indeed just four years ago, the world saw something like that with a revolution in Egypt whose supporters stormed police stations, defeated a President, conquered everything, until eventually after many months they reached barriers they could not overpass. The idea that two governmental forms can exist simultaneously for a time without either triumphing – and that this stasis can be reached in a single society, cut off from the rest of the world – seems to me to be an assumption specific to past decades when politics was limited to the nation state, where it was possible for revolutionaries in America (to whom the name of Trotsky was unfamiliar) to believe the local fable that he was a poor tailor of New York origins who had found himself by sheer fluke at the head of the Red Army. Such is the speed of communication these days that I no longer believe it is possible for a revolutionary force to emerge in one society without it already facing antagonists of international as well as domestic origin. Indeed the ascendancy of Syriza forces those of us who wish the Greek left well to think through unfamiliar questions about what the traditional goal of a revolution (ie the smashing of a state) means, in circumstances where a serious left-wing party finds itself temporarily, seemingly, without domestic opponents and faced with an enemy that appears to exist only several hundred miles away. It is a part of the answer to respond that Syriza’s enemies are not solely overseas. As I write, Syriza’s economists are drawing up – with many refinements, and under the shadow a troika veto – proposals to increase the income of the Greek state and reduce its expenditure. To do this, while at the same time raising pensions and the minimum wage and halting the previous government’s privatisation programme, they inevitably will have to promise that Syriza will suddenly clamp down of tax avoidance to an extent previously unthinkable in Greece. Syriza’s new idea, that if it cannot be a government that gives to the poor it may at least be one that takes from the rich, might fit entirely within the formal limits of the politics of austerity (although I have my doubts that the Eurozone will tolerate even this negative process of redistribution), but if Syriza was to do this seriously, and properly tax Greece’s shipping magnates – they of course will respond by funding, to an even greater extent than they do already, any party at all that promises to bring about Syriza’s immediate defeat. At this point, Syriza’s present ascendancy, its “Greek spring” where the leadership can claim the support of 80% of their population in opinion polls and can promise to govern in everyone’s interests without offending anybody, will inevitably begin to face much more sustained domestic opposition. The innocence of Syriza – in which it attempts to rule at first without domestic and then without international opposition – is therefore ultimately unsustainable. As is any theory which says that Syriza enemies can be reduced to the phantom, distant, figure of “Germany”. The longer it lasts, the more conscious the Syriza government will be of its enemies at home. The repressive power of the state has, under conditions of neo-liberalism, been dispersed a little across different kinds of institutions and relocated to some extent from the national to the international and from the political to the economic sphere. It follows that what is needed is a successful struggle against all the institutions of the rich, Canary Wharf as well as New Scotland Yard, the ECB in Frankfurt as much as the Parliament in Athens. So what should we do, those of us for whom Syriza’s success seems to offer the chance of a defeat to our own local rulers? I do not accept that our function is to formulate better negotiating feints and bluffs than the present Syriza leadership. One of the rules of this new, interconnected left in which we all live is that our successes and failures are widely shared, they are no longer the property of any one group but are visited on everyone else. It follows that you should always start if you can by assuming good faith in your fellow socialists. They are linked to you and you are linked to them, and they are entitled to a sympathetic hearing. The mistake of Varoufakis is not that he has spent too little time studying game theory. The problem with Tsipras is not that power has been thrust on him unexpectedly; rather he and his allies have spent three years preparing in their minds of this moment, and they have thought already as best they could the problems of every eventuality. If, for example, they do not believe that voluntary policies of Eurozone exit are a panacea, then we do not need to invoke bad faith or the simple label of “reformism” to explain their failure (especially not those of us who have long been sceptical of the politics of capitalism within one country which underpin the Grexit plans). We do have a duty to supporting them – if your union or party is not already an affiliate of a Greek Solidarity Campaign, it should be. 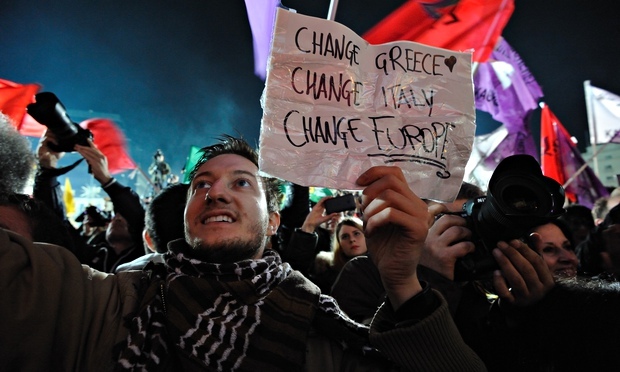 Syriza cannot be made responsible for organising giant protests against austerity in Berlin or London. That is the task for all the rest of us. Learning to think like a revolutionary is not about creating a Monument of political purity capable of dismissing every new force according to its failure to get beyond political categories written down on paper before our grandparents were born. There are new ideas, new people; not without grievous setbacks, the international left is at long last renewing itself. Sounds like you are returning to the perspective of revolutionary parliamentarism of Marx and Engels who were very clear that the task of socialists is 1) to organize and lead mass-based workers’ political parties that would 2) run in and win elections and begin to use their control of existing state machines to fight for the interests of the working class. A welcome development, to say the least. “Control of existing state machines” is an exaggeration. Substantial Marxist presence in Parliament is of course an absolute necessity. I agree that it’s very unlikely that we’ll ever see soviets again, at least not in an easily recognizable form, in advanced capitalist countries; the world has simply changed too much since the 1920s. Doesn’t mean we don’t still have to dismantle all capitalist states, of course. “I agree that it’s very unlikely that we’ll ever see soviets again, at least not in an easily recognizable form…” Russian-style Soviets never really gained traction independently or outside outside of autocratic contexts and it was a mistake for the revolutionary left in the West to make a fetish out of them for that reason. It didn’t help that Lenin’s whole post-1917 approach to socialist revolution in the bourgeois-democratic West hinged on the alleged superiority of “Soviet democracy” over “bourgeois democracy” which did a lot to shut down any type of critical thinking or strategic analysis of conditions that prevailed in the West. I don’t know if you’ve read a book Revolutionary Rehearsals, which gives a surprisingly wide set of post-45 soviets? The conclusion is online here (https://docs.google.com/file/d/0Bz3wUg3e6r_4ZmJkZjlmNmEtNWUyMC00ZDU4LWFhMTMtYTRkZTZmN2U0ZmFl/edit?ddrp=1&pli=1&hl=en#). I think almost all all its examples are from decaying autocracies, but this is a kind of society which is not unwholly unknown, even today (eg the Arab spring). There is also an even wider group of workers council movements described here – http://www.haymarketbooks.org/pb/Ours-to-Master-and-to-Own – although some of the examples in this second book are not exactly of soviets, more of the transitional forms that were (or weren’t) heading in that direction. To set out where I’m thinking more generally – I think that the best parts of post-1914 Marxism were right to insist on the necessity of democracy, and therefore (potentially) of more democratic forms than what we now think of as parliaments (eg recall of MPs, shorter terms for representatives, reallocation of power from the state to the micro or macro region, greater role for ordinary people in initiating legislation, etc etc – Podemos has some interesting practices which aren’t well known in the English language literature but are worth following). We should note that even in revolutionary Russia, workers’ councils never functioned like a government in continuous session; they met discontinuously, with executive committees managing their affairs. The crisis of governmental authority in Russia in 1917 was “solved” not by soviets but by Sovnarkom, the government formed by the Bolsheviks (and, initially, their allies), and its ability to reach out through the Bolshevik Party as a national organization. Since 1917, soviet-type forms have appeared in many strike waves and revolutionary crises, but they have never in practice formed an alternative, authoritative decision-making center for all of society. The problem of establishing institutional forms which will make authority truly accountable to the working class needs to be addressed in another way than that of looking to soviet-type forms as THE core structure of a new, proletarian state. Appreciate the thoughtful responses here comrades. I think JS is right when he notes that Soviet-style organizations or workplace-based institutions have never “in practice formed an alternative, authoritative decision-making center for all of society.” In Russia, the Constituent Assembly was supposed to play that role and could have if the Bolshevik-dominated Soviet government had held new elections for it to fix/replace the outdated electoral lists of summer 1917 that showed the SRs as a single, unified party when by fall 1917/spring 1918 there were Right and Left SR parties. The Bolsheviks unfortunately decided to scrap a system of universal suffrage for a system of selective suffrage and created a government that, by design, would never be able “an alternative, authoritative decision-making center for all of society.” Lenin insisted that this was only natural since it was “the dictatorship of the proletariat” and he and Kautsky sparred over this issue (and Kautsky was to a large extent echoing Rosa Luxmburg’s concerns and criticisms [or vice-versa]) from 1918 onwards. Lenin’s (specious) arguments that a proletarian government would necessarily deprive bourgeois citizens of the franchise, that parliaments as an institutional form were inherently bourgeois while soviets as an institutional form were inherently proletarian/revolutionary (the fact that soviets were essentially parliaments escaped Lenin’s notice), were never seriously scrutinized or challenged by revolutionary Marxists but taken as gospel without a second thought. The Sovnarkom wasn’t the whole of the Soviet government; it was created by the Second Congress of Soviets, a temporary gathering of all soviets across the country. Theoretically the Sovnarkom was subordinate to the Central Executive Committee, a body of dozens of people (men) elected by the congress to oversee the Sovnarkom’s work. Lenin held up this as a model of anti-bureaucratism when in practice it was quite the opposite. What I don’t understand is why didn’t the national congress of soviets stay in permanent session and become a permanent workers’ and peasants’ parliament? Maybe it was due to their own lack of direct parliamentary experience? “Why didn’t the national congress of soviets stay in permanent session?” The obvious comparisons are the English Parliament in 1640 or the third estate / the parliament in 1789, both of which insist upon their institutional superiority, and sitting permanently is a key part of that. Of course, one reason why they do is that they have had the experience of being dismissed previously just as they were beginning to flex their power – eg in 1629, after which Charles I refused to call a parliament for 11 years and you had the tyrannies of the Star chamber, Ship Money etc – so MPs “knew” from direct experience that if they wanted to retain their authority they just had to remain in permanent session. The All-Russian Congress hadn’t had the same independent learning experience (although arguably the Petrograd Soviet had). I’ve never read a verbatim account of the second congress (which I regret) although there are short accounts of it dotted all over the literature. My best guess would be that among the organised groups the only people who might have pushed for that would have been the Menshevik Internationalists, but that by that point they had walked out along with the rest of the Menshevik bloc. Clearly both the Bolsheviks and the Left SRs would have seen no need for a permanent session as each group had signed up in advance to the creation of People’s Commissars one of whose jobs would have been to ensure that there was another All-Russian Congress relatively shortly (the next Congress was in fact held just ten weeks later). There were around 300 independent delegates, who might have pushed for the Soviet to sit permanently but from my recollection of the motions passed by local soviets they hadn’t gone in that direction, the popular demands were rather – increasing or all power to the Soviets (which is a political slogan not a constitution for institutional arrangements), a ministry made up of socialists only and of several parties rather than a single party, and an end to the war – from the perspective of October 1917 it must have seemed that all these were happening. Come to think of it, it’s probably more likely that a majority of workers and peasants in the country at the time envisioned the Constituent Assembly sitting in permanence rather than the Soviet congress. The Provisional Government’s unwillingness to convoke the Constituent Assembly was a big reason why it lost support and Bolshevik agitation gained traction throughout the year. There’s an unusually useful Wikipedia entry, which makes some speculative comments about (amongst other things) the degree of peasant enthusiasm for the CA. The very high urban vote for the Bolsheviks suggests that most workers accepted a strategy of prioritising the Soviets over the CA. The other thing that I was reminded of, when reading this, is how snap the timescales are – within 8 weeks you have each of the storming of the Winter Palace, the 2nd All-R Soviet, the dissolution of the CA, and the 3rd All-R soviet: that’s less than the time it would have taken to communicate October to the countryside. Thanks for the discussion! Speaking of “of historical interest only” vs. contemporary relevance, what about Kautsky’s Republic and Social Democracy in France, the missing link between Marx’s Civil War in France and Lenin’s State and Revolution (or what I call “the real State and Revolution”)?